The ACS attributes the skyrocketing rates of the disease in those areas to obesity, lack of education and a lack of access to medical care. Due partly to colonoscopies, colon cancer is one of the most easily prevented cancers. The procedure can spot and remove pre-cancerous growths known as polyps before they become malignant, or find tumors easily when they are still easy to treat. Colon cancers can be removed surgically, and treatment is available to fight this particular diagnosis. Health insurers must pay for colonoscopies, but that doesn’t help people who don’t have insurance, and that’s a major hurdle facing many residents in these areas. “Particularly in the lower Mississippi delta and Appalachia, there are longstanding challenges, with high poverty, unemployment which coincides with less insurance coverage,” Siegel said. Siegel and colleagues calculated death rates for colorectal cancer on a county-by-county basis using software. 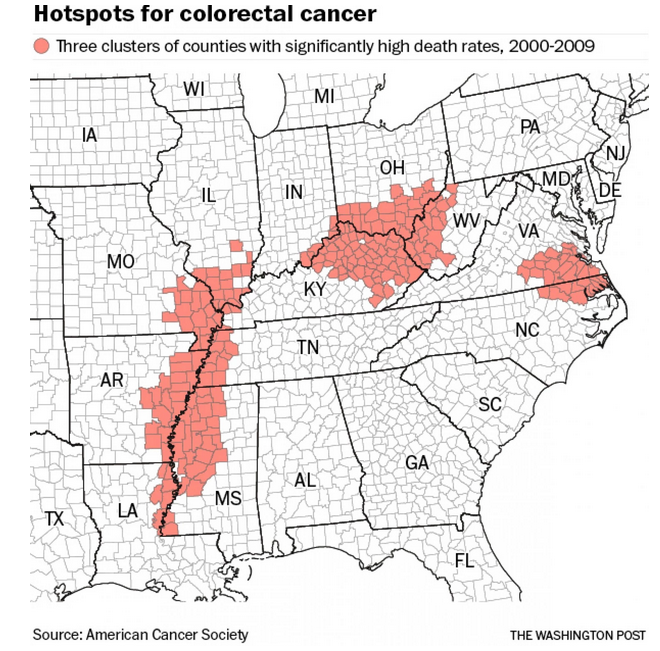 The scientists compared trends from 1970 to 2011 and found deaths from colon cancer were 40% higher in the Mississippi delta than in average areas across the country from 2009 to 2011. Their report was published in Cancer, Epidemiology, Biomarkers & Prevention, a journal of the American Association for Cancer Research (AACR). Colon cancer rates in the Mississippi delta were 18% lower than the average death rates in the rest of the country in the early 1970s. Those numbers rose by 3.5% a year for black men between 1970 and 1990, and haven’t moved since.